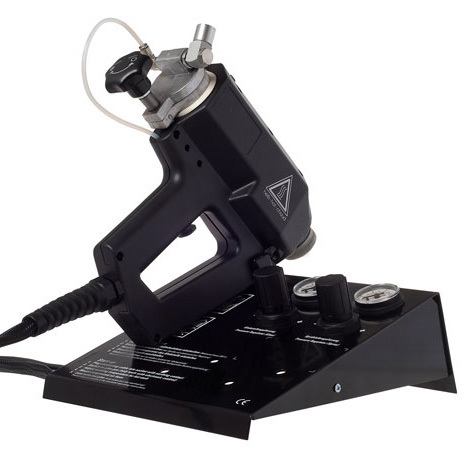 The TR 60 Hot-Spray-System consists of the TR 60 glue gun and the stand on which the gun may be deposited. Melting and pressure-sensitive glues can be dispensed from the smallest points of approx. 0,1 g to 100 m long and 2 – 150mm wide normal jetting patterns, extremely thin or millimeters thick. The control of the compressed air and the manometer are integrated in the stand. 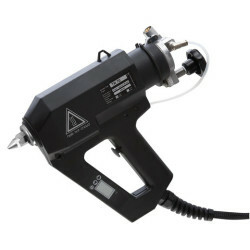 Precise adjustment of the compressed air ensures an optimum and accurate application of the glue. The adjusted air pressure can always be checked at the indication of the manometer. The electronic temperature control is integrated in the handle for easy operation. You adjust the optimum temperature for the selected glue from approx. 50 to 210°C. The electronic temperature control ensures an optimum operating temperature, simultaneously providing a careful handling of the material to be glued. The electronic system responds to the slightest deviation. Spraying glues has many advantages. The glue can be dispensed on difficult, inaccessible spots without any problem. Using pressure-sensitive glues you achieve a permanent application with unlimited open times (which so far could only be obtained by double-faced adhesive tapes). When applying or spraying melting and pressure-sensitive glues no solvents detrimental to health are released. Thanks to the great variety of Reka accessories you can choose an appliance configuration adapted to your individual requirements. 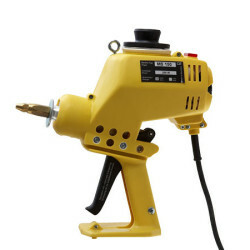 Category: Heavy Duty Glue Guns. Heat-up time approx. 3 – 10 min. 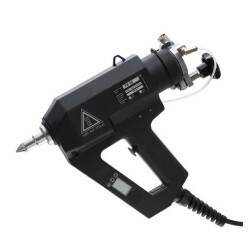 The TR 70 cartridge gun applies hot melt adhesives from 310 ml aluminium cartridges in dots, beads or other standard nozzle forms. The TR 70 has considerable advantages: It works with 310 ml aluminium cartridges. The appropriate nozzle is screwed with the adapter an to the aluminium cartridge, thus enabling quick cartridge change. The TR 70.3 is capable of working with PUR hot melts. PUR HMs distinguish themselves by an extremely high thermal stability. The electronic temperature control is integrated into the handle for easy operation. 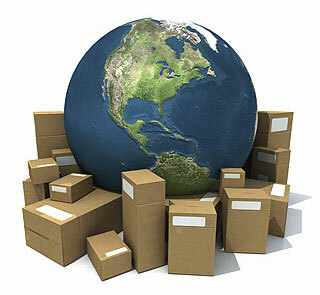 It provides an optimum working temperature simultaneously ensuring a careful handling of the material to be glued. The electronic system is easily adjustable. Due to the light weight and balanced design working with the appliance is not tiring and your wrist will not be strained. 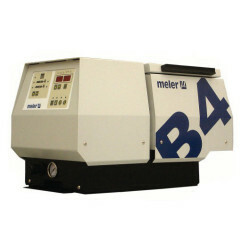 The B4 has been specifically designed to suit manual and “low cost” automatic applications.